White Rocket Books proudly announces the release in electronic formats of Gideon Cain: Demon Hunter, the multi-award-nominated Sword-and-Sorcery anthology co-created by Van Allen Plexico (SENTINELS; LUCIAN) and Kurt Busiek (Dark Horse’s CONAN; ASTRO CITY), among other New Pulp luminaries. Click here for the Amazon listing for Kindle! The book contains seven stories that see the dour Puritan battling evil both demonic and all too human, on land and sea, in deserts and forests and frozen wastes. Having witnessed the travesty of the Salem Witch Trials first hand, Cain leaves his home and family behind to fulfill his divinely-decreed destiny. Now, armed only with his flintlock pistols, imposing mortuary sword engraved with angelic runes, and his unshakeable faith in his holy cause, Cain relentlessly pursues the arch-demon Azazel, corruptor of Mankind, across the globe. Along the way, he clashes with pirates, savages, monsters and madmen. New Pulp all-star scribes Scott Harris, K. G. McAbee, James Palmer, Ian Watson, David Wright, and Brian Zavitz join writer/editor/co-creator Van Allen Plexico in delivering seven savage tales of holy vengeance. 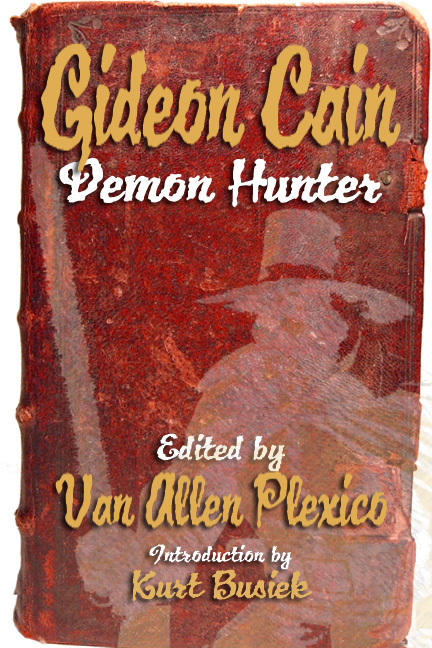 Originally published in trade paperback in 2010 by Airship 27, GIDEON CAIN: DEMON HUNTER was nominated for three Pulp Factory Awards (two for Best Story; one for best artwork) and Plexico and Watson were nominated for Writer of the Year by PulpArk. The new e-book edition (for Kindle and Nook, among other formats) presents all seven stories in their entirety, along with the Introduction by Busiek, at the low price of only $2.99.